Since invitations went out for the upcoming panel “Antisemitism and the Struggle for Justice” taking place at The New School tomorrow (Tuesday November 28), there has been an unprecedented onslaught of hateful attacks in the media and behind the scenes in an effort to shut down the event. This event was conceived many months ago by its organizers: Jacobin, Jewish Voice for Peace, Haymarket Books and Jews for Racial and Economic Justice, following publication of JVP’s anthology On Antisemitism [Haymarket Books 2017]. We see a critical need for a more diverse discussion of antisemitism, in light of the rise of white nationalists in the U.S., their links to “pro-Israel” figures and the dangers posed by “the new antisemitism,” defined primarily not as “attacks on Jewish people” but “criticism of Israel.” False charges that the panel itself is antisemitic only serve to illustrate the urgency of having this discussion. There was interest from multiple universities in the city to host the event. We are grateful that The New School is our venue. To its credit, The New School has refused to cancel the event amidst intense threats and pressure— taking seriously the role of universities to host discussions on critical issues of the day. 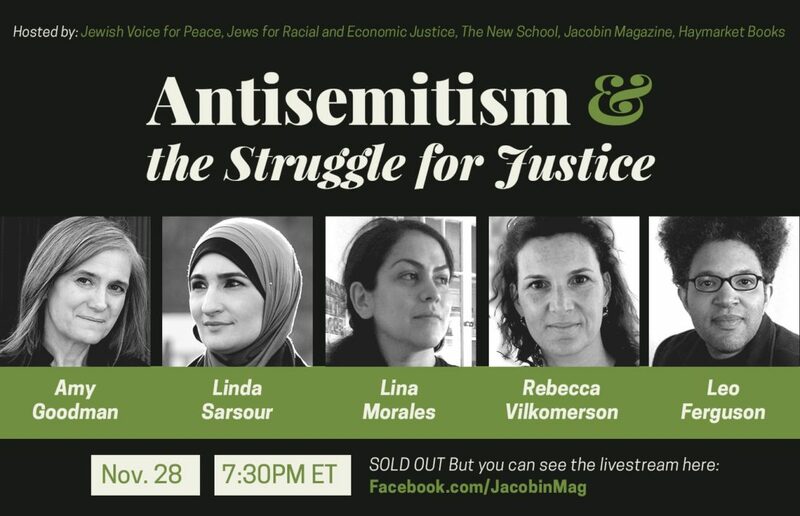 The efforts to tarnish The New School’s reputation and the baseless and reckless charges of antisemitism against the panelists only further strengthen our resolve to hold an event in which an open and candid discussion can be held on how to confront antisemitism within the context of the wider progressive movement for social justice. The event is sold out, but can be viewed by livestream here. Leo Ferguson is the Movement Building Organizer for Jews for Racial & Economic Justice.